(P2) But could it live up to this claim? (P3) Inspired by the incredibly close shaves he got from BARBERS in Italy, financial publisher Porter Stansberry wanted to see if he could REPLICATE the experience at home. (P4) He started OneBlade with only one goal in mind: create the razor that could give the world’s best shave. (P5) Stansberry picked a CEO, Tod Barrett, who then hired Brooklyn-based firm Pensa to create a design around Stansberry’s vision. (P6) Pensa spent over a year on the project, EVENTUALLY producing the OneBlade razor. (P7) We decided to TEST-DRIVE the OneBlade to see if it was worth the ACCOLADES it has received — as well as the $300 price. (P10) The razor comes with its own HANDSOME steel stand, which is even heavier than the razor itself. (P11) The blades are a unique, single-edged kind made by Feather, a well-known razor blade factory in Japan. They slide right into the back of the razor. (P12) No other company makes blades for this razor — in order to use the OneBlade handle, you must also use these blades. (P13) Shaving with OneBlade feels like no other shaving experience; it’s completely new. (P14) I wasn’t afraid of the razor before I used it, but I should have been. This razor is NOTHING TO TRIFLE WITH. Though it may look like a regular cartridge razor, it’s much sharper. (P15) Nothing I have ever put to my face has sliced the hair as quickly, cleanly, or efficiently as the OneBlade. It was extremely THRILLING, and I have to say it was by far the closest shave I’ve ever gotten. (P16) After I finishing shaving the side of my face, however, things got a little complicated. I could never quite FIGURE OUT how to MANEUVER the rather large head of the blade around my more delicate features. This resulted in not quite as close of a shave in those areas, and a careless slip that sliced the bottom of my lip open. It BLED for an hour. (P17) Once I realized the power of the razor I held in my hands, I began to fear it. (P18) My second shave went much better. I put in a new blade. (OneBlade recommends you use only one blade per shave. At $28 for 30 blades, that’s an expensive habit.) I began to respect the razor’s power. I let it guide my hand, instead of the other way around. (P19) Once I did that, I was able to escape my experience with only a small NICK on my chin. (P20) Is the OneBlade for you? 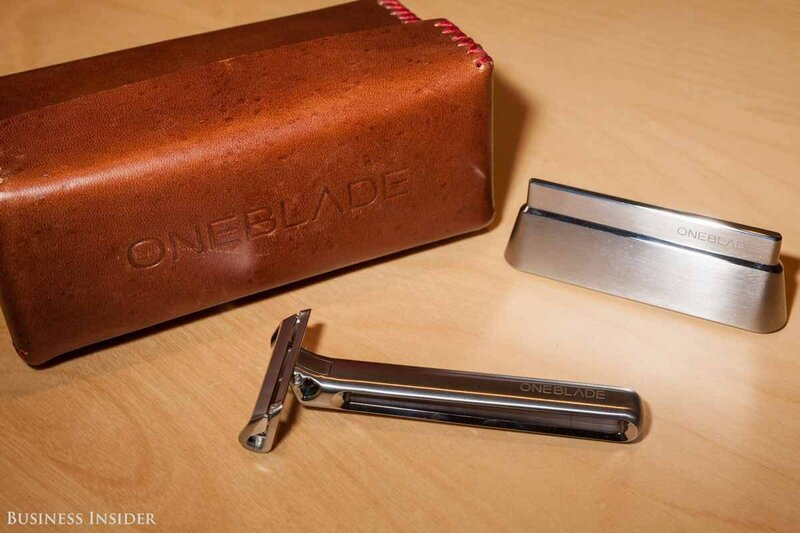 (P21) If you have $300 for the handle, plus $28 for every 30 blades, and are looking for the closest shave you can get at home, there’s nothing else quite like the OneBlade. (P22) However, if you aren’t concerned with getting the closest shave possible, and see $300 as a bit much to spend, there’s NO WAY the OneBlade is for you. (P23) For most men, a cartridge razor is just fine. Are you afraid of sharp tools like knives? The price of the OneBlade is very high. Who will this product appeal to? Do you enjoy reading about LUXURIOUS experiences that you would never be able to afford?